1 Iran: Seven nations signed an accord to freeze the Iranian nuclear program and have given themselves the first six months of 2014 to negotiate a final deal to curb Iran’s nuclear ambitions. Only about a third of Americans approve of the interim nuclear deal, according to a Pew Research Center survey. And nearly four-in-ten approve of President Obama’s handling of U.S. dealings with Tehran. If efforts to reach a final agreement with Iran should fail, publics in the countries involved in the negotiation are divided about what should be done. Among those who oppose Tehran acquiring nuclear weapons, nearly two-thirds of Americans support preventing the Iranians from developing nuclear arms, even if it means taking military action; as do roughly six-in-ten French, half the Germans and nearly half the British, according to a Pew Research poll. But only about a third of the Chinese and roughly three-in-ten Russians would support a military intervention. 2 China: The superpower rivalry between China and the United States will continue in 2014, in an environment in which the Americans don’t much like China and the feeling is mutual among the Chinese toward the United States. Less than four-in-ten Americans have a favorable view of the Middle Kingdom and only four-in-ten Chinese hold a favorable opinion of America, according to a Pew Research Center survey. And their sentiment about each other is worsening. Both populations sense a shift in the balance of power. Two-thirds of Chinese think Beijing has already or will one day replace Washington as the world’s leading super power. And nearly half of Americans agree. China’s recent territorial disputes in the East and South China Seas could be the first big flash point in the new year. These quarrels have created serious tensions with Beijing’s neighbors. Overwhelming majorities of Filipinos, Japanese and South Koreans — all U.S. military allies — say these disputes are a big problem for them. 3 Syria: International negotiators plan to meet in Geneva in January to see if they can find a peaceful solution to Syria’s nearly three-year-long civil war. Prospects for compromise are complicated by conflicting public opinion both in the United States and within the region. Two-thirds of the American public approved of President Obama’s decision to delay military strikes on Syria to see if diplomatic efforts could convince Damascus to get rid of its chemical weapons stocks, according to a Pew Research Center survey in September. And despite the fact that such dispersal is now ongoing, less than a third of the American public approves of the president’s handling of the Syria situation. Meanwhile, majorities in the region—Turkey, Jordan, Lebanon, Israel and the Palestinian territories—are concerned that the violence in Syria will spread to neighboring countries. But, with the exception of Jordan, most oppose either Arab or Western countries sending arms and military supplies to anti-government groups in Syria. 4 Drone Warfare: Washington’s use of drones to target extremists in countries such as Pakistan, Yemen and Somalia is likely to continue to fuel anti-American sentiment because it is widely opposed around the world. Among the 39 nations surveyed by the Pew Research Center in 2013, half or more of the public in 31 countries disapproved of such military action. But U.S. drone strikes could well continue in 2014. Half of Americans say such actions have made the United States safer from terrorism. 5 Privacy: In 2013, the world learned a lot about the U.S. government’s surveillance methods from Edward Snowden, a former security contractor for the National Security Agency. The leaks stirred controversy in the U.S. and with allies, and there’s no sign Snowden is done spilling NSA secrets. A number of European publics reject the idea that national governments are justified in collecting the telephone and internet data of citizens in other allied countries, even as part of the effort to protect national security. This includes nearly three-quarters of the Germans, more than half of the French and Swedes and more than four-in-ten British, according to a German Marshall Fund survey. 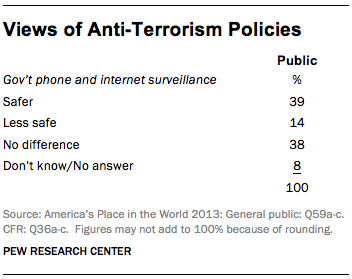 But more than twice as many Americans say that the NSA’s surveillance program has made the country safer from terrorism than think such activities have made the nation less safe. 6 Inequality: President Obama’s singling out inequality as “the defining challenge of our time” signals a new focus on income and wealth disparities in 2014. A 2013 report from the Organization for Economic Cooperation and Development (OECD) found that income inequality among OECD countries “has increased by more over the past three years to the end of 2010 than in the previous twelve.” Emerging market economies face similar challenges, the organization found. Not surprisingly, economic inequality is a common concern for publics around the world, according to a Pew Research Center survey of 39 nations. Most people agree that the economic system favors the wealthy. Majorities in most countries say the gap between the rich and the poor has increased in the past five years. This attitude is particularly prevalent among those who live in advanced economies. And at least half the publics in most countries say the wealth gap is a very big problem in their nation, with developing economies expressing especially high levels of anxiety. Notwithstanding these concerns, and somewhat contrary to President Obama’s assertion, nearly every public surveyed wants the government to focus on creating jobs or taming inflation as a top priority, rather than on reducing economic inequality. This is particularly evident in the United States, where less than half the public says the gap between the rich and the poor is a very big problem and just roughly one-in-six want inequality to be the government’s top economic concern.